BC Watches has proudly announced that they are offering an astounding 60%+10% discount plus 1 extra Italian genuine leather straps with the butterfly clasp to its customers via Kickstarter. The Barcelona based Spanish watch company will launch a crowdfunding campaign via Kickstarter next Wednesday 1st and backers of that campaign will be able to reserve their watches on these special discounted rates. Founded by Bruno Caldarelli, a seasoned Italian watch and jewelry dealer who from many years resides in Spain, the company has made a name for itself in the industry with the finest range of luxury watches inspired by the racing world of Formula 1. “After becoming aware of the possibilities offered by the crowdfunding, I realized that it was time to offer my own watches capable of giving moments of ecstasy to their owners without letting them spend a fortune.” Said Bruno Caldarelli, The Founder of BC Watches while announcing the Kickstarter campaign. “I welcome watch lovers from around the world to support this campaign and get their watches on surprising rates.” He added. 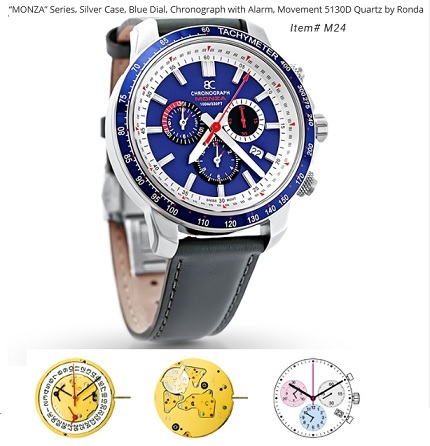 In addition, the company is offering these watches with 60%+10% discount and FREE worldwide shipping plus 1 extra Italian genuine leather straps and an amazing wooden case so that people from around the world making pledges to this campaign can get their watch. Besides it Swiss and Japan movement models, customers can also opt for an additional luxury with the 18K gold-plated models offered by the company. In a nutshell, these watches are a blend of the legendary Swiss watchmaking and Italian style as well as sportiness to give a timeless experience. BC Watches was founded in 1996 by Bruno Caldarelli, a renowned watch and jewelry dealer. The company has an international reputation, offering services to small and medium enterprises and has their business allies mainly from EU. BC Watches has a very sustainable policy which gives their client an outstanding experience with maximum attention. According to the founder, the inspiration for the founding of the company was gotten from the racing world of Formula 1. He gathered all his technical knowledge, contacted old friends, visited tanneries and metallurgists, renowned watchmakers in Italy and in Switzerland as well as experts Asian manufacturers in order to obtain high quality watches with a unique Italian design. He was able to actualize his dream and end up having one of the best watch dealerships the world has ever seen. All BC Watches are backed by an international 5 years warranty. BC Watches: A mix of artistic inspiration and elegance. Simply irreplaceable.